Home / Resources / Residential Security / Summer is Here: Is Your Pool Gate Properly Secured? Whether you have a private backyard pool or manage a community or public pool, safety is surely your main concern. Security measures should always include a gate and a gate lock and there are several options to consider. In the period between Memorial Day and Labor Day at least 163 children under the age of 15 fatally drowned in swimming pools or spas last year, according to the U.S. Consumer Product Safety Commission. Although it has been improving over the past two years, Pennsylvania used to rank fourth in the country the amount of drowning deaths and near-drownings in pools and spas. Unfortunately, last year saw a record number of drownings in New Jersey. However, you can make your pool secure and help bring these grim statistics down. Studies show that many pool drownings are due to a lack of access protection. In order to keep kids safe, experts recommend installing a fence that surrounds the pool or hot tub entirely. But a fence alone does not guarantee that kids won’t go in the water. It should have a gate that closes and latches automatically. Magnetic gate latches ensure that the gate closes after every entry and exit to the pool area, preventing unsupervised children from accessing the area. Self-closing and self-latching gates are required in the state of Pennsylvania and many other states. In addition to an automatic closing feature, the gate must have a locking device to keep trespassers and unsupervised kids from accessing the pool. There is a wide range of effective locking mechanisms designed to secure pool areas. Let’s take a closer look at options for public, apartment, neighborhood and community pools. For most situations, we suggest keyless or key keypad gate locks. Many pool owners and property managers are discovering the ease and benefits of using keyless entry locks for recreational areas. For public and community pools with hundreds of residents that require access, it’s more secure and cost-effective to go keyless for a number of reasons. Keyless entry systems eliminate the need for making copies of keys and periodically changing the locks. 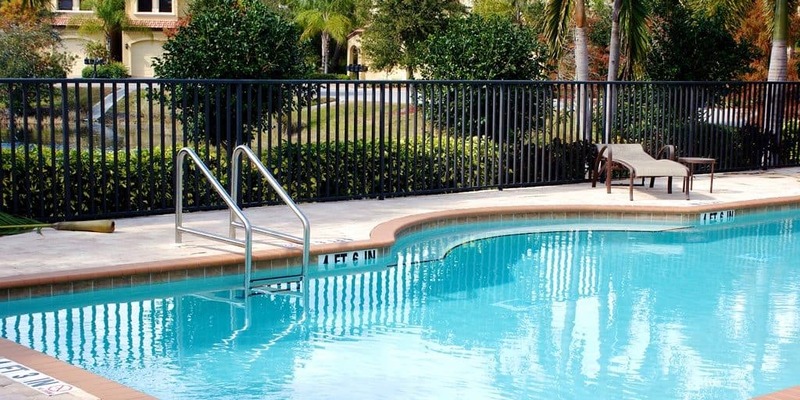 Apartment complexes and homeowner associations are quickly adopting locks that work with key fobs or access cards because it’s easy to grant immediate access to pool members. All they have to do is pass their fob or card in front of a digital reader. At the same time, keyless systems make it possible to restrict times the pool can be accessed and block entry to specific users when necessary. The most common keyless entry system for pools are those with keypads. In order to access the pool, members must enter the correct code in the keypad. There is no worry about lost or stolen keys, nor the cost of replacing them or rekeying the lock. Keypad systems are affordable solutions and the number of members able to utilize them is virtually unlimited. Similarly to a keyless system, pool managers can block access at night or other specific times. Although, we recommend changing the passcode periodically to deter unauthorized entry to the pool. Pool safety is a serious concern. For both residential and shared swimming facilities, we must take every precaution in order to prevent accidents. ●	The pool should be entirely surrounded with fencing that reaches at least 4 ft.
●	The fence must have a self-closing, self-latching gate with a lock. ●	The pools should have a rigid safety cover. ●	Always supervise children near water, even if they know how to swim and lifeguards are on duty. ●	Keep life jackets, throw rings and safety devices on hand and visible around the pool area. ●	Have a first aid kit in case of an emergency. ●	Stay updated on your CPR certification. ●	Make sure everyone in your family knows how to swim well. If you are looking to increase security around your pool, simply call one of our offices to speak with a lock expert. The team of residential and commercial locksmiths at Great Valley Lockshop can help you find and install the best lock solution. You can reach our offices at (610) 644-5334.